Matilda is a young, gray tabby and a newcomer to the Meadow Green Farm. Feeling lonely she searches for new friends. She meets an older cat named Socks who also lives on the farm. Matilda soon learns that her energetic and playful attitude does not mesh well with Sock's laid back demeanor. In order to earn Socks' respect, Matilda decides to attempt the daunting task of climbing the high beams of the barn. However, once she reaches the highest point, she freezes with fear. Socks realizes she is missing and tries to get the horses to help find her. In their mission to get her down, Matilda learns that her fellow barn animals do care about her; they just have different ways of showing their feelings and building friendships.Through colorful illustrations and an endearing story, this latest addition to the Let's Talk series teaches children that affection, friendship and caring comes in many forms. P.J. 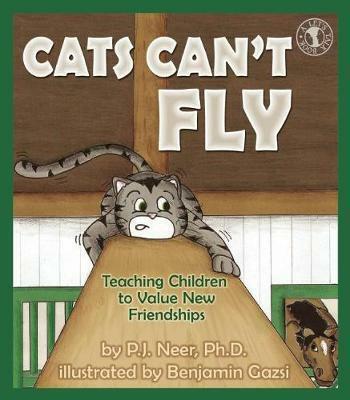 Neer, Ph.D. is a psychotherapist who has worked with children of all ages. She and her husband Ken own and run a horse boarding facility, Meadow Green, which is the inspiration of her books. She holds a Doctorate of Philosophy in Counseling Psychology from West Virginia University and resides in Morgantown, West Virginia.Benjamin Gazsi is an art student at West Virginia University. He lives in Morgantown, West Virgina.